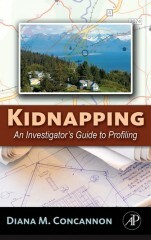 Kidnapping: An Investigator’s Guide to Profiling is based on a three-part analysis of 100 randomly selected kidnapping cases prosecuted in the United States that have survived Supreme Court appeal. The results of the analysis are incorporated into each chapter as part of the exploration of the inductive profile of each kidnapping subtype, thereby offering a statistically based tool that can inform investigative strategies and the allocation of limited resources. The analysis includes standardized input from four levels of professional law enforcement including a forensic psychologist, a crime analyst, a detective, and a city prosecutor. In addition to chapters pertaining to the kidnapping subtypes, an introductory chapter is dedicated to the evolution of U.S. kidnapping law and intervention strategies, including a review of relevant case law (Megan’s Law, Amber Alert). Appendices include a concise summary of all the subtypes and Tabletop Drills that law enforcement can use to support potential kidnapping victims prepare and better respond to a kidnapping threat. Dieser Beitrag wurde am 09. Jul 2010 von Oliver Obst in e-Books veröffentlicht. Schlagworte: e-Books, Elsevier, Elsevierbuchpaket.